Tibetan Thangka painting of Manjusri. The word bodhisattva means "enlightenment being." Very simply, bodhisattvas are enlightened beings who work for the enlightenment of all beings. They vow not to enter Nirvana until all beings achieve enlightenment and can experience Nirvana together. The iconic bodhisattvas of Mahayana art and literature are each associated with a different aspect or activity of enlightenment. Prajna is most closely associated with the Madhyamika School of Buddhism, which was founded by the Indian sage Nagarjuna (ca. 2nd century CE). Nagarjuna taught that wisdom is the realization of shunyata, or "emptiness." To explain shunyata, Nagarjuna said that phenomena have no intrinsic existence in themselves. Because all phenomena come into being by means of conditions created by other phenomena, they have no existence of their own and are therefore empty of an independent, permanent self. Thus, he said, there is neither reality nor not-reality; only relativity. "'Emptiness' means 'empty of intrinsic existence.' It does not mean that nothing exists, but only that things do not possess the intrinsic reality we naively thought they did. So we must ask, in what way do phenomena exist? ... Nagarjuna argues that the existential status of phenomena can only be understood in terms of dependent origination" ( Essence of the Heart Sutra, p. 111). "Manjusri is the bodhisattva of wisdom and insight, penetrating into the fundamental emptiness, universal sameness, and true nature of all things. Manjusri, whose name means 'noble, gentle one,' sees into the essence of each phenomenal event. This essential nature is that not a thing has any fixed existence separate in itself, independent from the whole world around it. The work of wisdom is to see through the illusory self-other dichotomy, our imagined estrangement from our world. Studying the self in this light, Manjusri's flashing awareness realizes the deeper, vast quality of self, liberated from all our commonly unquestioned, fabricated characteristics" (Bodhisattva Archetypes, p. 93). Manjusri's most dynamic attribute is his sword, the vajra sword of discriminating wisdom or insight. The sword cuts through ignorance and the entanglements of conceptual views. It cuts away ego and self-created obstacles. Sometimes the sword is in flames, which can represent light or transformation. It can cut things in two, but it can also cut into one, by cutting the self/other dualism. It is said the sword can both give and take life. "The sword of prajna has two sharp sides, not just one. It’s a double-bladed sword, sharp on both sides, so when you make a stroke of prajna it cuts two ways. When you cut through deception, you are also cutting through the ego's taking credit for that. You're left nowhere, more or less." Manjusri first appears in Buddhist literature in Mahayana sutras, in particular, the Lotus Sutra, the Flower Ornament Sutra, and the Vimalakirti Sutra as well as the Prajna Paramamita Sutra. (The Prajna Paramitata is actually a large collection of sutras that includes the Heart Sutra and Diamond Sutra) He was popular in India by no later than the 4th century, and by the 5th or 6th century he had become one of the major figures of Mahayana iconography. Although Manjusri does not appear in the Pali Canon, some scholars associate him with Pancasikha, a heavenly musician who appears in the Digha-nikaya of the Pali Canon. Manjusri's likeness is often found in Zen meditation halls, and he is an important deity in Tibetan Tantra. 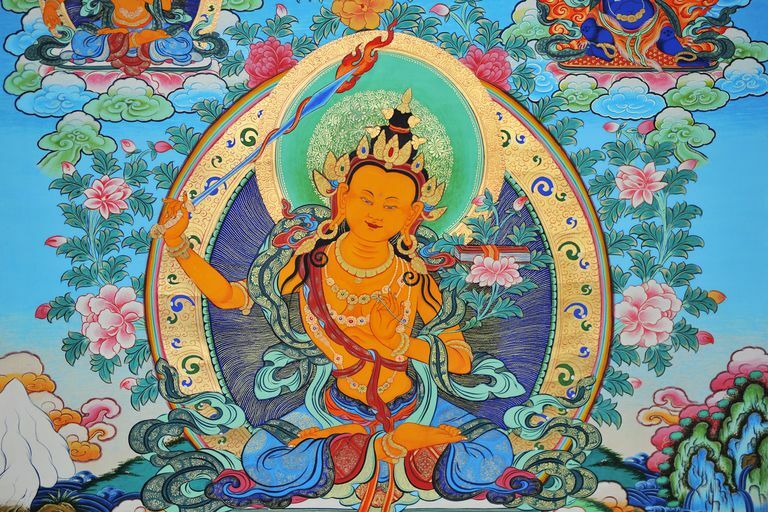 Along with wisdom, Manjusri is associated with poetry, oratory, and writing. He is said to have an especially melodious voice.